Stories – Images – Crafting the Stories of Our Lives! A friend, an incredible friend showed me a bench he made, a simple, yet eye-catching blend of curved lines, legs extending inward, forming a eye-catching bench. I smiled at the quality of his workmanship, the ah in his eyes, a job well done. His image, his pride, his success in his craft. Images flood my mind. So often in the role of storyteller, social worker, life living individual on the earth plane. How often I forget to take time to develop an image, a goal, a destination in my own life for the things I truly desire. So at the end, I too can uphold the end result in pride, quality of a job well done. Thank you for the lessons of work well done, an image provided direction and a celebrated outcome. What is the image you hold in your mind today? What project, idea or goal do you have and what image do you add as your desired outcome? What is your story today and the large story for tomorrow? Images are the key to stories, images are the key to shaping the stories of our lives. Hum . . . to an imaged filled day with celebrated results! Until next time . . . Let a Storyographers Journey Begin! Thank you Jerry Neal for your inspirational interview and insights! I had the incredible opportunity to speak with Jerry, a local poet and author on the subject of oral tradition, the similarities and differences on how poets and storytellers craft their work and what inspires him. Jerry, smiles, leaning slightly forward in his metal handled chair, recalling an instance when a poet, at a poetry reading, attempted to read a poem that he had not read in almost twenty years. The result was a flattening, lifeless experience for both writer and audience members alike! Shaking his head, Jerry wondered what the poet might have thought, feeling, imagining when they wrote this piece of poetry. He wondered how this poem touched that person’s life, their heart, and what inspired them to write it to begin with. He further talked about wondering what the impact of the poems phrases felt like when this person was writing the poem and how this again comes through in the reading of this poet’s work through the reader’s diction, rhythm and meter of their voice. I too had to smile! Jerry’s words ignited my inner awareness, enthusiasm and reflections in the art of storytelling and the artistry of story development. How does the story touch me? What images are going through my mind’s eye as I retell this story? What feelings and emotions are part of the story, the characters and the reality of their lives? How is my voice, my jesters and other personal expressions reflect specific aspects of the story and its story-line? Why is it important to me to tell this story? How does this story benefit the audience? How do I benefit from telling this story? In extended appreciation to Jerry Neal, local author and poet! Bringing Joy to the World! Karin Volo’s Inspirational Story! Karin Volo, a nationally and internationally known, acclaimed business developer, success coach, dedicated partner and Mother of two young children, ages 6 and 8, entered into the San Diego airport for a return flight home. Only one week prior to this, Karin’s wildest dreams rapidly unfolded in her life; moving into her dream home, watching the Law of Attraction movie “The Secrete”, preparing for the launch of her highly successful business across two more countries, now standing, with the man of her dreams and business partner, excitedly awaiting a flight back home to their family in Sweden. A tap of the shoulder from an US Marshall at the San Diego, CA airport in March of 2006 changed Karin’s and her family’s life forever. Karin, being immediately placed under arrest, handcuffed, jailed, accused, yet never convicted or sentenced, for a crime she never committed, in a country that was not her own. This devastating, life altering news reached her family, without even a chance to hug her young children good-bye. Karin, now facing the horrifying uncertainty of living, locked down, in the seamlessly, never-ending, mind numbing lines, rows, and levels of iron bars encasing cement defined rooms. Her life now in ever wavering jeopardy, facing possible extradition to Mexico, strip searches, pat downs and head counts . . . Fear and terror threatening to over take her, determined, she enacted the law of attraction. Armed with the book “Yoga for Dummy’s” from the prison library and her courage, she served to meet the needs of herself, her family and fellow inmates for the next 1,342 days. During this time she led other women in powerful visualizations of their lives, outside iron bars, and cement walls. In these visualizations the women loving transported their children from one activity to another, celebrating their accomplishments, supporting them in their dreams, somehow embracing the knowledge, through faith, that today’s reality would never become tomorrow’s destiny. Armed once again with books from the local prison’s library, Karin studied meditation and spirituality. 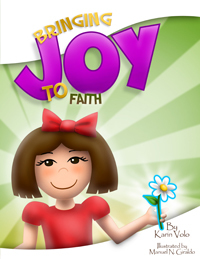 During her now daily meditation sessions the image of a girl, named Joy, spoke to Karin. In the course of her communication with Joy, Karin authored 27 books relating the deep spiritual truths that she was learning in a manner that her children would understand. Joy grew illuminating Karin’s mind and her time. One by one, she wrote, illustrated and sent these Joy books to her family in Sweden. It was through Joy that Karin and her family embarked on a life transforming, Spiritual journey together. Karin’s story so immeasurably touched me, by the incredible gift she gave her family, as during these tough times her books, her words, her presence, her Mothering stood so markedly strong and far-reaching. I am inspired by the strength of Karin’s love and parenting as she continued nourishing and nurturing her family and friends through her inspirational stories. While Karin could not be there in person, she was present in so many other ways. I could just see her children receiving one of these incredible gifts, the kind we all love to give our children. Sitting there with their Father, welling with excitement in anticipations of receiving and opening these immense treasures from their Mother. Through their now Father’s voice, hearing their Mother’s words read through a literary journey of hope, faith and love’s transforming power. Then the excitement of sharing it with their friends: “Look at what my Mom . . .” The incredible gift of skills, tools, strength, self-worth and empowerment that Karin gave each member of her family. I can not image what Karin’s children thought or felt as they received these treasured gifts from their Mother. Then, 3 years and 10 months later, receiving the news that Mon was coming home. Thank you Karin and Joy!